In the shade of the ancient olive trees you will find the “Gli Ulivi” (The Olives) Golf Club , on the hills surrounding San Remo. The Club was founded in 1932 and designed by British architects, it is one of the most important golf clubs in the Mediterranean area and the very first golf club in Italy. Set in a marvellous natural scenery, the Golf Club is surrounded by age-old olive groves and green hills in a panoramic position overlooking the Ligurian Sea. It is the perfect place for golf enthusiasts and is suitable for both expert and beginner golfers. After spending a relaxing day golfing the greens among the olive groves, you can then enjoy a tasty dinner at the Golf Club restaurant. Throughout the year several important events are organized here, such as the International Winter Tournament in February organised by the Rotary Fellowship, the “Trofeo delle Due Riviere” (Trophy of the Two Rivieras) in March, and other events that take place in summer and fall. 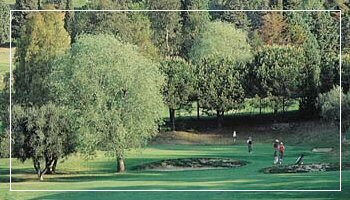 You can easily reach the Golf Club both from Genoa- via the A10 Genoa-Ventimiglia motorway (take the “San Remo est” exit, then drive along the Aurelia bis road to the “Ospedale” exit, then follow directions to S. Giacomo, San Romolo, and the Golf Club)- and from France- via the A10 Genoa-Ventimiglia motorway, coming from Ventimiglia (take the “San Remo ovest” exit then follow directions to the Golf Club). San Romolo Minigolf was opened in July 1992 and offers an 18-hole golf course, a bar, a restaurant, and several other facilities. The course winds beneath the shadowy leafy branches of the forrest. As a sign of environmental awareness and protection, a wooden bridge was built to prevent any damage to the roots of an age-old chestnut trees. Within the Club premises you can see all its trophies and hire both clubs and golf balls, but you can also chose to relax at the terrace bar. Several tournaments are organized by the Club, such as the Summer Trophy for amateurs, and the San Remo IT, the “Town of San Remo” International Trophy, and the “European Master” for experts. San Romolo is a hamlet within San Remo municipality (about 800 m. above sea level). You can easily reach the Club via the A10 Genoa-Ventimiglia motorway (take the “Arma di Taggia” exit, drive along the Aurelia bis road; after reaching San Romolo, drive 10 km more and here you are). If you chose to get to San Remo by train, you can take the bus departing from Piazza Colombo to San Romolo in about 20 min.